My first K-T Key is finally here! I’m excited to see what all of you guys think, please send me some feedback on what I could add or change. Suggestions are always welcome. But let me start out with thanking everyone who participated in ELIMINATE Week! Being its first year, I’d consider it a successful one. 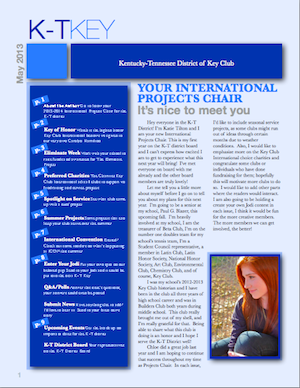 In this issue the K-T Key focuses on Caroyln Hamilton recieving the Key of Honor, ELIMINATE Week, and International Convention, check it out!